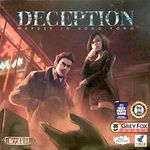 In the game, players take on the roles of investigators attempting to solve a murder case – but there's a twist. The killer is one of the investigators! Components still in great condition - game has only been played a handful of times. Box has some shelfwear (especially the bottom) and the plastic insert has some creases.